Thanksgiving is all about friends, family, and, of course, food! We love to sit back, indulge in some delicious food with our families, and sit back with the game on in the background. But what about our furry friends? Here are 7 foods to never give your dog this Thanksgiving (and 7 foods that are safe for your buddy as well)! Turkey Skin – Cooked turkey skin dressed with all the fixings like marinade, butter, spices, and oil is pretty tasty, but this high fat food is extremely dangerous for your dog. These fancy add-ons make turkey skin very hard for your dog to digest and can lead to pancreatitis when consumed. Do everything you can to keep this out of your dog’s reach! Cooked Bones – Dogs like bones, but the small bones present in turkey and ham dishes are not safe for dogs at all. These bones can easily splinter inside the dog’s digestive tract, and you could find yourself making an extra (and very expensive) trip to the emergency room. Be safe and dispose of the bones carefully and right away so your pup doesn’t have a chance to eat them. Nuts – Nuts are very dangerous for your dog, especially walnuts and macadamia nuts. They can cause a toxic reaction within your dog, and within 12 hours, your dog can start vomiting, having tremors, have a fever and weakness, and could even not be able to stand. While these symptoms usually go away, the consumption of nuts can lead to deadly shock. Sage – This herb has essential oils that can cause your dog’s stomach to get upset. Be sure to keep it out of your dog’s reach so he can stay happy and healthy! Onions and Garlic – These foods contain sulfides, which are toxic to dogs. Also, cooking them does not reduce their toxicity, so please keep it far away from your pup! Nutmeg – This spice is used to provide a punch to sweet potatoes and pumpkin pie, and while we humans tend to enjoy it, nutmeg can cause seizures and central nervous system issues if your dog gets a hold of it. Sometimes in extreme cases, nutmeg can also cause death. 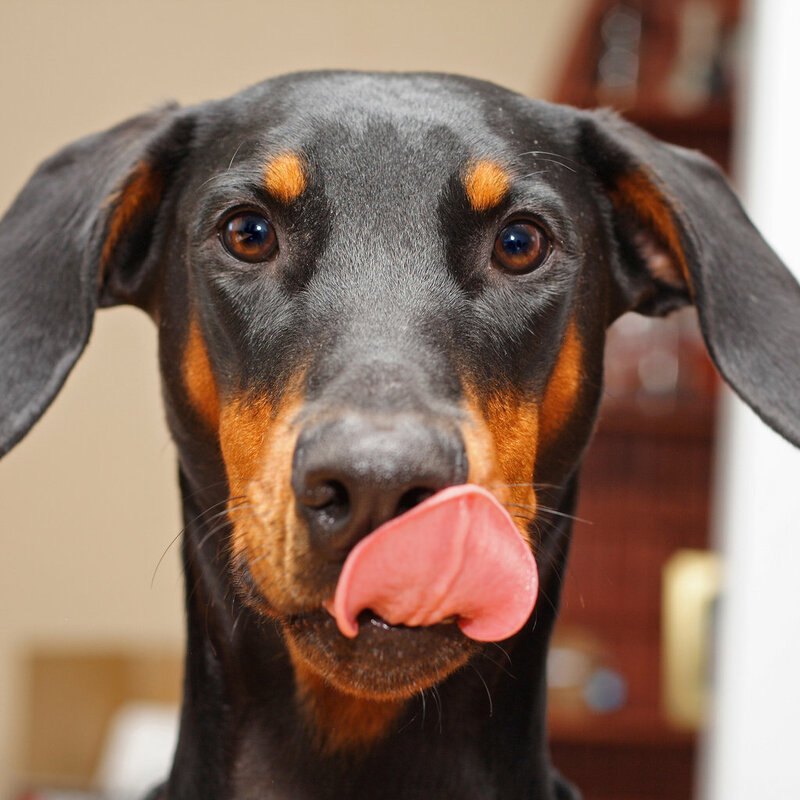 Chocolate, Batter, and Dough – You more than likely know that dogs aren’t allowed to eat chocolate, but you might not be aware that dough and batter are off-limits as well. When ingested, dough can actually rise inside your pup’s stomach, causing bloating and severe pain. Additionally, both dough and batter contain raw eggs, which may contain salmonella, so be sure to keep these human goodies away from your dog! Turkey – Cooked turkey in moderation is okay for dogs to have. Just don’t go overboard, strip it of its skin, and choose lean white meat every time. If you’re in doubt, feel free to consult your vet before letting your dog try some. Cranberries – Cranberries aren’t just great for people – they’re great for dogs, too! Chock full of vitamins A, B1, B2, and C, cranberries are well-known for helping bolster and maintain a healthy urinary tract. If you make cranberry sauce from scratch with fresh fruit, feel free to share some with your pup! However, if your cranberry sauce this Thanksgiving is canned or jellied, don’t give it to your dog because it’s full of sugar. Carrots – Fresh, raw carrots are an ideal snack for dogs – they love the crunchy taste, and carrots are full of fiber, potassium, and an array of vitamins. They’re great for dental health, too, because they help remove plaque from teeth and keep breath fresh. Feel free to give your dog a few carrots before you cook them or add any salt to them! Sweet Potatoes – They might be called “sweet,” but don’t let that fool you! These potatoes are healthier than regular spuds and have a lower glycemic index and tons of fiber, vitamins, and carotenoids. Feel free to share some if they don’t have salt, butter, or nutmeg! Green Beans – Green beans are a healthy snack for dogs anytime! Their full of all vitamins, minerals, and fiber, AND they’re low in calories. Just be sure to give your pup the green beans before you decide to prepare a green bean casserole dish for Thanksgiving. Bread Rolls – Bread rolls are good in moderation. Just think of them like treats as they are not an all-the-time food for dogs. If you share one roll or even just half a roll with your dog this Thanksgiving, you won’t be causing any harm! Pumpkin – Pumpkin is good for dogs because it has beta carotene, fiber, and vitamins, AND it’s low in calories! Pumpkin is also very easy for a dog to digest; in fact, if you see that your dog is suffering from an upset stomach, diarrhea, or constipation, a little bit of pumpkin can help. Stay away from canned pumpkin, though, and be sure that there’s no nutmeg present in the pumpkin as well. Thanksgiving is the perfect time to spend with your family, including your furry friend! Sometimes, though, you can’t take your pup with you on your journeys. When that happens, bring him somewhere that will take the best care of your buddy – BauserHaus! Call us at (314) 961-3911 or find out more about us online at www.bauserhaus.com! Have a happy Thanksgiving! This entry was posted in Tips and tagged BauserHaus, doggie daycare STL, holiday tips and dogs, how to protect dog during Thanksgiving, Thanksgiving food not for dogs, Thanksgiving food to give to dog. Bookmark the permalink.